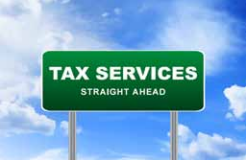 Tax revenue represents a dependable source of income for national development. For all countries, especially those dependent on revenue from finite natural resources, such as gold, oil, and gas, a dynamic link ought to exist between revenue and its efficient utilization. The test of success is efficiency in the management of the inverse relationship that should exist between natural resource exploitation and growth in human capital. As natural resources are exploited, high value enduring assets, such as human capital, must be produced to replace depleting assets. Countries that have succeeded in engendering efficient operation of the natural resource – human capital development relationship, are reaping the benefits through enhanced socioeconomic development for their people. In this regard, Botswana’s commendable effort deserves special mention. Within a decade of restructuring its diamond mines, Botswana has succeeded in transforming its economic fortunes with a significant increase in its Gross Domestic Product (GDP) per capita from US$3,180 in 2000 to US$15,700 in 2010 (1). The unfortunate reality with most natural resource-rich developing countries, however, points to a situation of disappointment as governments find it difficult to maximize revenues from significant increases in export earnings accruing to Multinational Mining Companies (MMCs) (2). In this respect, revenue accruing to governments has at best remained minimal compared to other revenue sources, such as corporate taxes from the services sector. The focus of this article is to investigate the issues preventing natural resource-rich developing countries from maximizing revenue potential accruing from commodities, especially in the wake of increasing world market prices. Remedial measures in place to improve revenue generation from natural resources exploitation shall also be examined to assess the extent to which the interest of the state is protected. A review of extant literature revealed two major issues impeding maximization of benefits from natural resources for the sustained development of natural resource-rich developing countries. Lack of transparency in contracts and the harmful effects of corruption are critical issues affecting the efficient harnessing of revenues. The 1980s and 1990s constituted a difficult period in the economies of most African countries. Dwindling volumes and value of export revenues from natural resources characterized this period. This unfortunate development resulted in the reliance by a number of African nations on International Financial Institutions (IFIs) for economic stimulus packages to shore up their fiscal and international trade deficits. Bailout packages agreed with IFIs included the advice to divest national interest in natural resource management and ownership in favour of MMCs for their claimed expertise and resourcefulness in harnessing potential benefits inherent in extractive industries. Contracts executed since reflect systematically lower prices as key incentive strategy to attract and retain the interest of Foreign Direct Investment (FDI). Under most of the FDI contract terms, national governments have had to contend with returns arising from carried interest, royalties, property rates, and corporate taxes as main sources of income. Such unfavourable contract terms account for the relatively low returns and income earned by natural resource-rich countries in the past decade that limit maximization of potential income even in the wake of increased prices that have characterized trade in minerals, oil, and gas, etc. The price of an ounce of gold for example, increased from US$347.20 in 2002 to US$1,644.90 in 2012, yet African states did not benefit fully from this windfall (3). Low carried interests, royalties, corporate taxes and ground rents limit the potential of natural resource-rich developing countries, such as Ghana, from increasing their share of revenue in tandem with phenomenal price increases. Although revenue from gold increased from US$995 million in 2005 to US$2.38 billion in 2009, Ghana government’s share was US$40.5 million in 2005 (four percent of total) and US$154.5 million in 2009 (six point five percent of total) of the share accrued to MMCs. While in absolute terms these amounts appear significant, a fairer share would have significantly increased Government resources to finance development projects and reduce its dependence on aid. The Ghana Government’s inability to renegotiate better rates on royalties in particular, account for its reliance on foreign aid to supplement its development budget. Although the Minerals and Mining Act, 2006 (Act 703) stipulates royalty rates of between three and six percent, most mining companies in Ghana paid the lower rate of three percent until March 2011 when a flat rate of five percent was introduced (4). That upward review did little to change the situation. The contribution of gold revenue to Ghana’s total revenue as a consequence remained low at an average of 6.5% despite the over 230% percent increase in gold revenues in the five years from 2005 to 2009. Abuse of transfer pricing constitute the dominant challenge to maximization of governments’ share of natural resource revenue. Transfer pricing, a means by which imported input costs are padded to facilitate transfer of higher amounts to suppliers, remains detrimental to host countries because of avoidance of payment of appropriate legitimate taxes. This abusive practice of transfer pricing also unduly affects declared profit before tax through increased input cost that reduce taxable profit. Additionally, government loses revenue through capital flight – transfer of huge and illegitimate proceeds from transfer pricing. Practices related to transfer pricing account for a minimum loss of US$160 billion annually to developing countries (5). Complicity on the part of revenue officials tasked with the responsibility of monitoring activities of MMCs, entrench the negative practice of under-declaring production volumes and revenues. Failure to regularly replace revenue officials, with some remaining at a post for well over a decade, compromises their professionalism to the detriment of their nations (6). 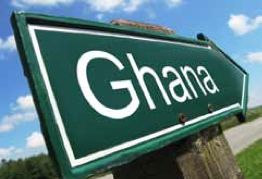 Ghana’s revenue from natural resources is derived from profits accruing mainly from carried interests and corporate taxes and royalties based on the revised five percentage fixed rate on volume and value of extracted minerals and oil and gas. A key success factor, therefore, for revenue generation from the two sources, is the technical competence and experience of revenue collecting agencies to accurately assess profit levels on which returns are determined. The primary challenge is that it would appear that Ghana has not independently converted its natural resources into reserves to ascertain their economic value. More so, revenue agencies do not have the capacity to assess independently the veracity of declared export earnings by MMCs. Given these serious drawbacks, the Ghana Revenue Authority (GRA) had no other option than to accept profit, volume, and value levels declared by MMCs on which tax assessments are made. This is a daunting challenge that has to be surmounted to engender increased revenues from natural resources to serve the best interests of the country. The other major challenge is how to balance the need to increase revenue from rising export prices and earnings with the reality of mitigating political risk via stability agreements to ensure increased inflow of new investment into the lucrative mining sector. Stability agreements under Ghana’s Mining Law have been crafted to mitigate political risk and assure investors of the safety of their investment over a 15-year timeline. This in part accounts for Ghana’s inability to take full advantage of the ongoing significant increases in prices of minerals such as gold. In the 2012 budget for example, the attempt by the government of Ghana to reintroduce the windfall profit tax that was removed from the Minerals and Mining Law in 2006, attracted stiff opposition from MMCs. The contention of MMCs was that the government could not unilaterally vary validly executed contracts to the detriment of MMCs. 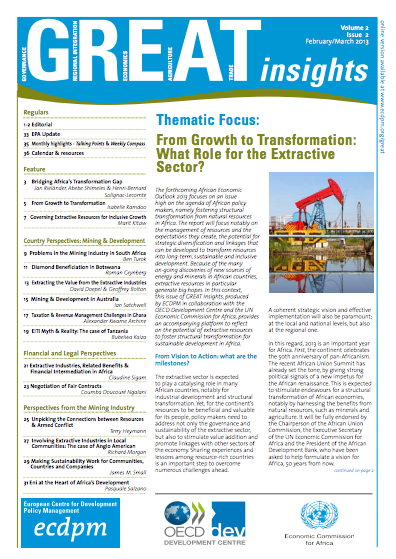 Accountability and transparency principles enshrined in the Extractive Industries Transparency Initiative (EITI), if supported with requisite national legislation, efficient implementation and close monitoring, will help reverse the negative trends in the management of revenues from natural resources. The EITI is a transparency tool adopted by natural resource-rich countries in 2002 to inject accountability and transparency into the retrieval and utilization of revenues from natural resources. Enactment of appropriate accountability legislation, similar to a Freedom of Information Bill, which seeks to inject accountability and transparency into national operations, will compel stakeholders engaged in natural resource extraction and management to play by the rules. This will make information available for scrutiny to help obviate the age-old practice of massaging income and returns on investments for the mutual benefit of stakeholders. Savings made through efficient harnessing of resources from natural resources invested in social infrastructure such as education, will reflect better use of revenue thus earned. Provision of education will enhance the capacity of natural resource-rich countries to replace revenue from natural resources with relatively stable and easy to manage returns on human capital. Additionally, where appropriate, nations could gain from the knowledge and expertise of their citizens whose services could be exported for relatively better value compared to finite natural resources. The significant contribution of the services sector in most African countries to GDP is a credible example of the value that human capital could contribute to sustainable development. Accelerated and subsidized education as passport to a good life for the people must be offered as worthy replacement for depleting natural resources. Alexander Kwame Archine is head of the Development Policies wing of the Institute of Diplomatic Practice and Development Policies (I-2DP) Accra, Ghana. 1. CIA World Fact Book (2012). Botswana GDP – per capita (PPP). Retrieved from: www.indexmundi.com/botswana/gdp_per_capita_%28ppp%29.html. 2. Natural Resource Watch (2012). Report on Ghana. Retrieved from: www.ibis.dk/dokumenter/index.php?mode=download&vcFile=ibisdoc335_nrw_ghana_final.pdf. 3. African Economic Outlook (2011). External Financial Flows and Tax Receipts in Africa. Retrieved from: www.africaneconomicoutlook.org/en/outlook/. 4. Natural Resource Watch (2012). Report on Ghana. Retrieved from: www.ibis.dk/dokumenter/index.php?mode=download&vcFile=ibisdoc335_nrw_ghana_final.pdf. 5. 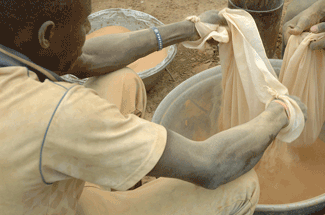 Blog (2010) Gold Mining in Mali: Who Really Profits? Retrieved from: www.financialtaskforce.org/. 6. Manteaw, S. (2010). 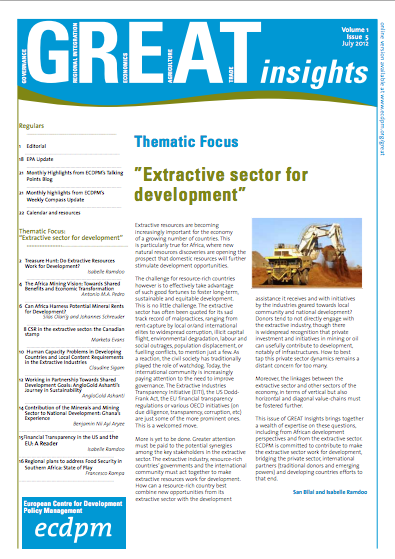 Ghana’s EITI: Lessons from Mining and Policy Implications for Oil. Ghana Policy Journal, 4, 96-109.